Hidden beneath the humus-rich topsoil, the subsoil usually receives little attention in agricultural practice. Yet, plants cover between 10 and 80% of their nutrient and water needs from subsoils. Measures to improve the subsoil could help in bridging droughts and stabilising yields. But how do farmers and other societal actors perceive different methods for subsoil management? Ecologic Institutes's Ana Frelih-Larsen, Mandy Hinzmann and Sophie Ittner published the first exploratory research results on the societal acceptance of subsoil management. The article is published in Sustainability, Issue 09, Volume 10, and is available for download. The research is part of the project Soil³ - Sustainable Subsoil Management, funded by the German Federal Ministry of Education and Research (BMBF) via the BonaRes funding programme. Soil³ aims to improve the overall nutrient and water use efficiency of plants through subsoil management and, thereby, to secure or increase crop yields in the context of an emerging bioeconomy. Frelih-Larsen, A.; Hinzmann, M.; Ittner, S. (2018). 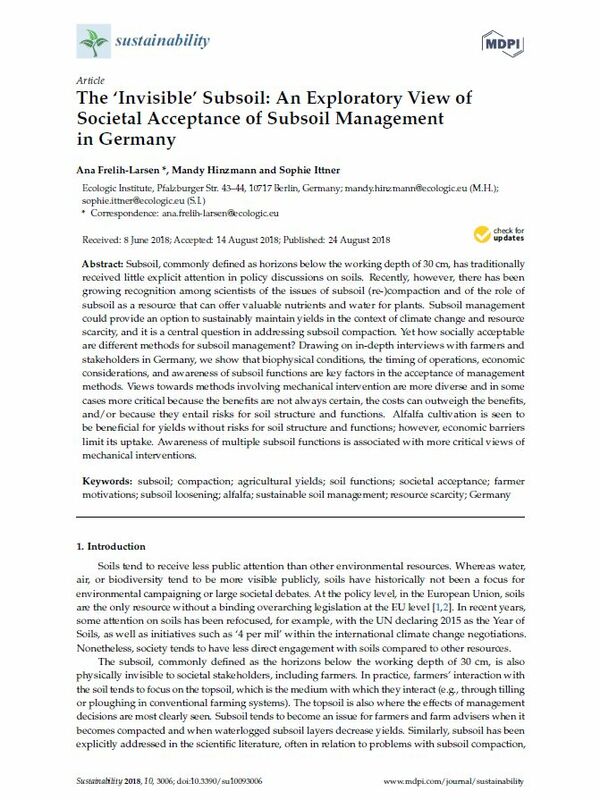 The 'Invisible' Subsoil: An Exploratory View of Societal Acceptance of Subsoil Management in Germany. Sustainability 2018, 10, 3006.